All people who spend time in the backwoods will have an encounter with a species of snake at some point in time. Most are harmless to humans, but there are several species of snakes that must be given a wide berth due to their potentially dangerous disposition. A bad encounter with a dangerous snake will result in a life-threatening situation, especially for people that are not aware of the consequences. It is important to remember that all species of snakes are beneficial to the environment and are a necessary component of the ecosystem. In the past, it was common practice to kill all snakes that were encountered and this practice resulted in the severe degradation of the populations of many species of snakes. Today, in many states, species of snakes are considered endangered and are protected by law. First and foremost, if any snake is encountered, it should be left alone. View it from a safe distance. Admire it for the natural beauty that it certainly does possess and consider it as a fellow neighbor of the backwoods. In North America, we are fortunate that every species of snake which is present does not have a hostile intent towards humans. If given a choice, all snakes that reside in North America would rather avoid all encounters with humans. This is not the case elsewhere in the world. On the continent of Africa, there is a venomous snake called a black mamba. This snake is especially aggressive and there have been confirmed reports of this snake actually pursuing humans with the intent to bite them. If bitten by a black mamba, the result is often a painful death. Luckily for us, our snakes do not possess the aggressive disposition of a black mamba. Most encounters with snakes in North America will be uneventful. But, there are other encounters that should be avoided if possible. Throughout many portions of North America and the lower 48 states, we have five types of different snakes, with several varying species of these, that are dangerous: the coral snake, copperhead, cottonmouth, rattlesnake, and the non-poisonous, yet quite aggressive northern water snake. Of the group of poisonous snakes, the venom of the coral snake is considered to be the most lethal. As the venom of this snake spreads throughout the body of the victim, it rapidly induces respiratory failure within hours, followed by death. 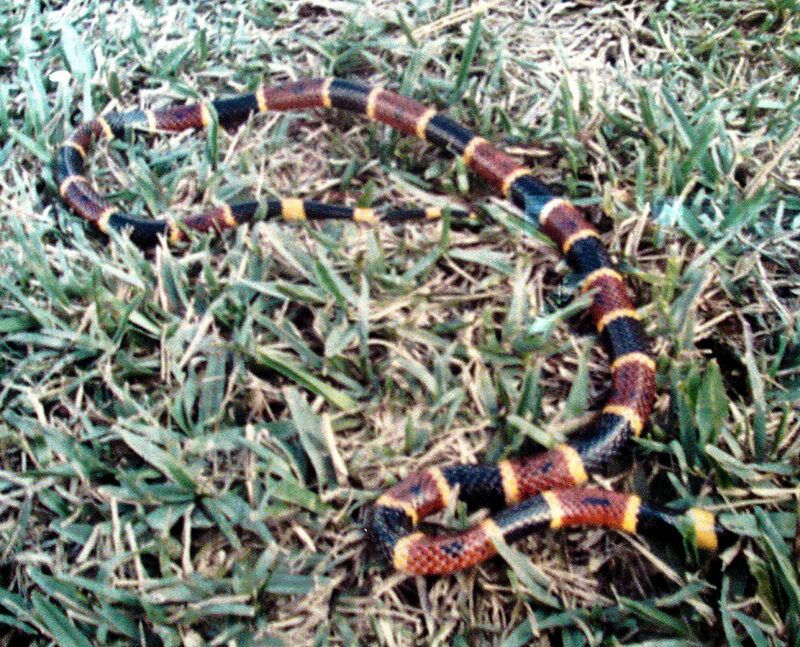 If bitten by a coral snake, medical attention must be sought immediately. Out of all the snakes on our dangerous list, the coral snake is the most colorful, having red, yellow, and black bands along the length of its body, which averages 36 inches in length. 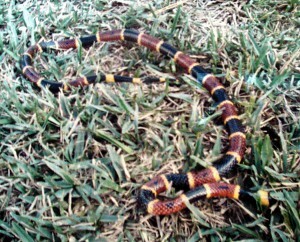 Coral snakes are throughout Florida, north to North Carolina, and from points west to Mississippi. They make their home within the dense ground vegetation and can also be found within the water. 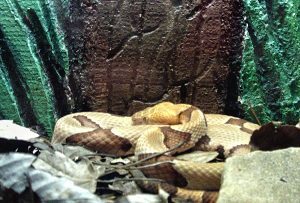 Copperhead snakes are pit vipers and are a poisonous, lethal ambush predator, who will lie in wait for prey to come near. Possessing a perfect camouflage pattern consisting of a tan color with darker cross bands, these snakes blend in perfectly with the forest floor of their preferred woodland habitat. When approached, copperheads will not move and most bites to humans occur when the snake is inadvertently stepped upon or touched. These snakes can attain an average length of 36 inches. Copperhead snakes are common throughout the central and eastern United States, from Georgia to Maine. If bitten by a copperhead snake, medical attention is immediately required. 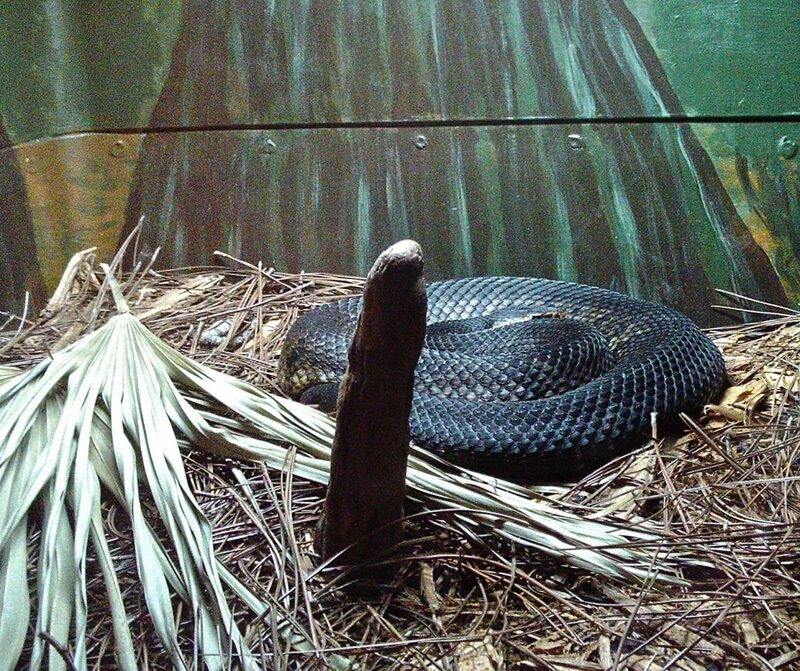 Cottonmouth snakes, also known as water moccasins, are poisonous pit vipers with aggressive bad attitudes. Most always found within or near water, both fresh and saltwater, these snakes can swim very well. These are large snakes and can attain sizes up to six feet in length. Black body color is the most common, but snakes with brown bodies and darker cross bands can occur. When approached, a cottonmouth snake will stand its ground and become most aggressive. The bite is quite painful and potentially fatal. Seek medical help immediately. Cottonmouth snakes have a range from Virginia to south Florida and points west from Missouri to Texas. Rattlesnakes are poisonous pit vipers with a very large range and can be found within virtually any of the lower 48 states. Multiple species of this snake exist with the largest being the eastern diamondback rattlesnake, which can attain lengths up to seven feet. 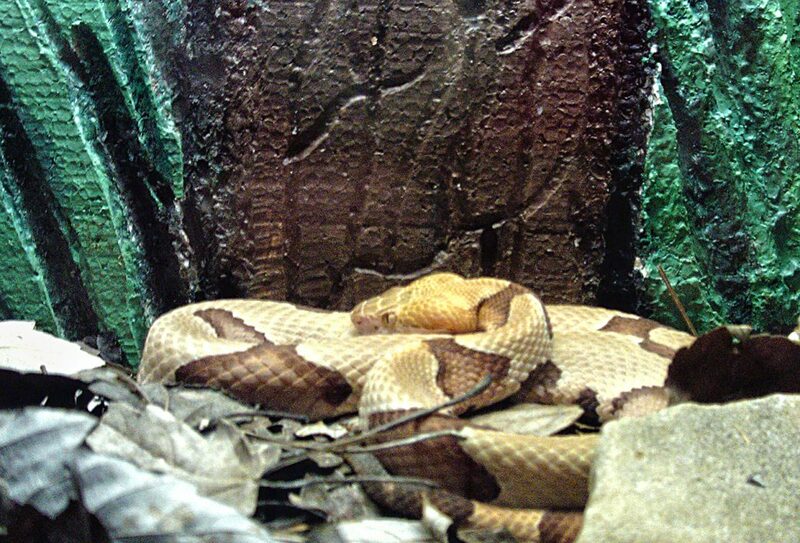 The timber rattlesnake is often five feet in length. Most other species are three feet or slightly less in length, with the smallest being the pygmy rattlesnake, which is usually no larger than 29 inches. Color of rattlesnakes will vary with the species, but most common color is a brownish body with darker bands. 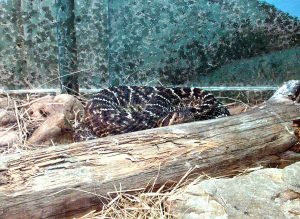 The diamondback will exhibit dark diamond-shaped patterns and the massasauga rattlesnake of Pennsylvania and southern New York has a considerably darker body. The bite of the rattlesnake is extremely painful and the toxic venom will produce swelling and tissue destruction. Seek medical help immediately if bitten. 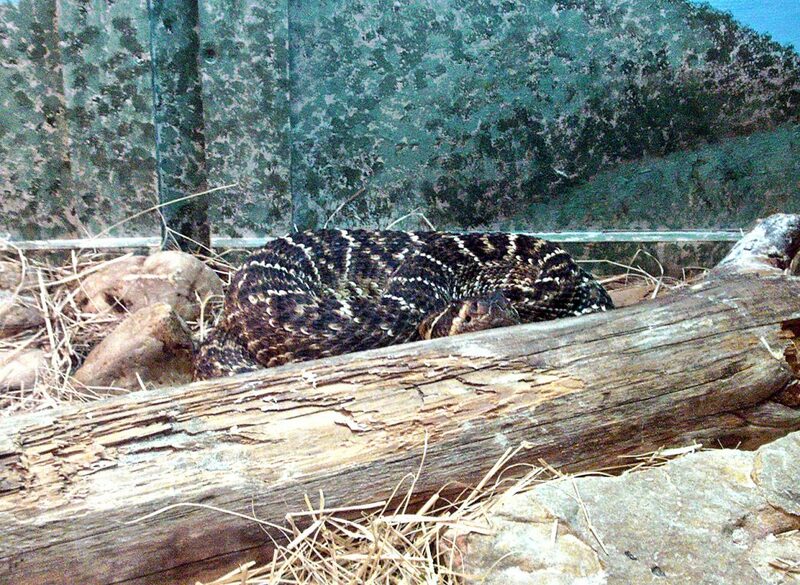 Many rattlesnakes rattle their tails when approached or threatened and would rather avoid humans if possible. Rattlesnakes will not hesitate to bite if they feel threatened or provoked. Avoid a rattlesnake that is presumed to be deceased. Unique to this species, the head of a rattlesnake that has been severed from its body can still have life functions such as seeing and biting, for periods of up to an hour after death. Northern water snakes do not possess a poisonous venom, but these highly-aggressive snakes are always irritable and ill-tempered when approached. Rest assured that these northern water snakes will make an attempt to bite you, sometimes inflicting multiple bites, and the bite is quite painful. An anti-clotting agent is present within the fangs, so if bitten, you will bleed uncontrollably. Infection is also common at the area of the bite, so when bitten, it is highly advisable to seek medical attention. These are large snakes that can achieve body lengths up to four and a half feet. Northern water snakes are agile swimmers above and below the surface of the water. Most common within or near water, they will occasionally venture a distance from water in search of prey, if necessary. Colors can vary, with dark brown and darker stripes being somewhat common. Larger species will often be black in color. Northern water snakes are fairly common throughout central and eastern North America, with some areas having rather large populations. The range of this snake appears to be expanding and they have been transported to California where they are now considered a permanent invasive species. All of the mentioned snake species can be active both day and night, as they have the ability to see quite well in the darkness. People venturing outside at night should be aware of this, because it is very difficult to see these snakes in the dark. People living and spending time in the backwoods should always exercise caution when outside. Be aware of your surroundings. Look down and around when walking. Never reach into darkened locations or reach underneath anything without extreme caution. For that matter, never put your hands or feet into places where you cannot see them. Be careful around bunches of branches, logs, and rocks on the ground. Never blindly step over them. Go around them carefully. Logs and rocks are prime places for snake hideouts. Snakes will also conceal themselves in crevices within rocks. 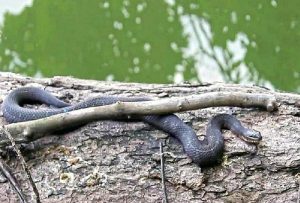 Cottonmouth and northern water snakes like to lie on the banks of streams and ponds, so fishermen should be very careful when emerging out of water or boats and stepping onto a bank. Clothing and footwear choices are important. If you are within dangerous snake habitat, wear long pants and sturdy footwear. Each year in the United States, more than 7,000 people are bitten by dangerous snakes. It is also estimated that upwards of 15,000 domesticated animals are bitten by dangerous snakes every year. This is a viable threat that people should be aware of. Residents and frequent visitors of the backwoods have an advantage over people that do not spend much time in the same environment, and that is because they are more in tune with their surroundings. If a person spends a considerable amount of time within the backwoods, that person becomes part of the backwoods. They are more aware of the existing wonders and potential dangers that are around them. Be careful when spending time outside. My thanks to the Reptile Discovery Center in Deland, Florida, for letting me take pictures of these snake species.